Okinawans used to ask, “Which would happen first, an Okinawan becoming the Prime Minister, or an Okinawan high school team winning the Kokoyakyu baseball tournament?”　High school baseball has been carrying the hope of Okinawans for a long time. When I grew up in the 80s and early 90s on the island, people were glued to the TV once their teams set foot in Koshien stadium, the holy ground of high school baseball. People tuned in during work hours and cars disappeared from streets; a victory for their team carried that much importance to the locals. Young baseball players were heroes who went up against strong opponents from mainland. The locals were hoping the young players would embody the “catchup and takeover the mainland” mentality that many Okinawans used to have. “For seniors, the summer tournament is the last opportunity. So every team will put their blood in each game,” said former manager Hiroshi Arasaki, looking back at the old days. 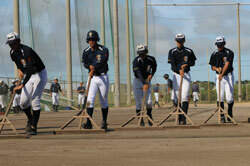 The enthusiasm for high school baseball carries on today in Okinawa. Some islanders would still put priority on high school baseball games over their jobs, and they still joke about how streets see less traffic when a game is on. However, if compared with the enthusiasm in the past, Okinawans’ love of the game seems to have moved on a bit. As someone who witnessed the fever through the 80s and 90s, I now sense less madness in the way Okinawans root for their teams or the local media covers the games. Whether or not my view is correct, it would be hard to deny the impact that four national titles won by Okinawan teams between late 1990s through 2010 had on locals - especially when Okinawa Shogaku Senior High School won the first ever national title for Okinawa in 1999. The fulfillment those four titles gave them may have made their love of the game mature. And more importantly the titles surely brought some changes to high school baseball in Okinawa.